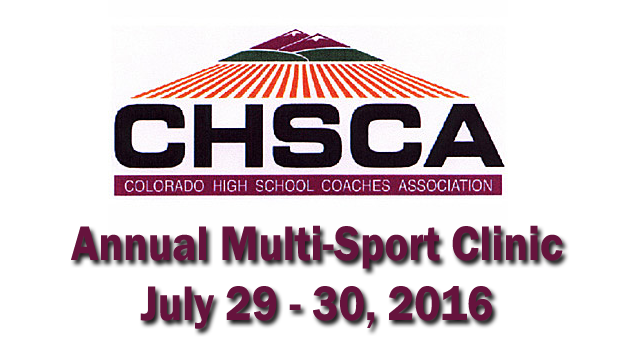 The CHSCA Multi-Sport Clinic is once again being held at the Radisson Hotel-Denver Southeast on July 29th and 30th. This year's cross country speakers will be some of the best from around the country, and right here at home in Colorado. Registration is currently being accepted and can be done online at www.colohsca.org or in-person at the clinic. Ben's current training group, NAZ Elite, has become one of the premier professional running groups in the United States. Amongst Coach Rosario's athletes are former Wheat Ridge standout Scott Fauble (4th place at the 2016 U.S. Olympic Trials in the 10,000m), and 2016 US XC Champion Craig Lutz. Recently, Coach Rosario has taken on the title of author. His new book "Tradition, Class, Pride" reveals the secrets to building a high school cross country dynasty. Coach Rosario covers everything from pre-season parent meetings to post season awards banquets, as well as how to train for championship meets. Coach O'Malley has steadily become one of the best high school distance coaches in the United States. In 2015, his boys team captured the large class cross country state championship in Illinois, and then followed it with an impressive NXR-Midwest Championships, and a 4th place showing at Nike Cross Nationals. Most recently, Coach O'Malley's boy's team won the New Balance Indoor 4xMile Championships in a time of 17:16.36. A 4:19 per mile average. His boys 4x800 team followed up in the spring with a 7:37, averaging 1:54 per leg. One of Colorado's finest coaches. Coach McConnell has grown the Peak-to-Peak program to be one of the most dominant in the state of Colorado. Coach McConnell will be talking about the ins and outs of coaching the female endurance athlete. Under the guidance of Coach Boele, Paul Roberts had one of Colorado's all time successful senior campaigns by becoming a finalist for both Nike Cross Nationals (11th), and the Footlocker National Championship (5th). Coach Boele will be discussing how to extend an athletes season successfully into the post season. One of Colorado's best 800-meter coaches. While at Chaparral HS Sep produced 4 boys 4x800 state championships, 2 girls 4x800 championships, and 2 individual state 800m championships from Kristen Lake. Coach Seppala will be discussing speed development for endurance athletes. GENERAL SESSION (GRAND BALLROOM) - JOE EHRMANN & JODY REDMAN - "Why Do You Coach?" Cross Country (PIKES PEAK) - John O'Malley - Carl Sandburg HS, Illinois - "Training and Racing Psychology"
Cross Country (SUMMIT C) - Brian Seppala - Chaparral HS (former)/Liberty MS - "Speed Development for the Endurance Athlete"
Cross Country (PIKES PEAK) - Ben Rosario - Northern Arizona Elite - "Tradition Class Pride"
Cross Country (PIKES PEAK) - Ben Rosario - Northern Arizona Elite - "Training for 5K"
GENERAL SESSION (GRAND BALLROOM) - Karen McAvoy, PsyD | Director, Center for Concussion Rocky Mountain Youth Sports Medicine "CONCUSSION TRAINING"
GENERAL SESSION (GRAND BALLROOM) - JOE EHRMANN & JODY REDMAN - "How Do We Model What We Want From Our Athletes?" Cross Country (PIKES PEAK) -Jeff Boele - Lyons HS - "Extending an Athletes Season"
Cross Country (SUMMIT C) - Kim McConnell - Peak-to-Peak HS - "Coaching Girl's XC"
Cross Country (PIKES PEAK) - John O'Malley - Carl Sandburg HS, Illinois - "Performance Training"